I know my heart will break when this is over. Princes don’t end up with girls like me. And there are many things he doesn’t know about me. Secrets I can never tell anyone. No matter how many times I tell myself how wrong this is, I can’t resist him. I can’t stop myself. I thought I could leave Elle. I told myself I was protecting her. What should have been nothing more than a distraction has become so much more. An addiction. An obsession. It’s too late to prevent either of our hearts from breaking now. 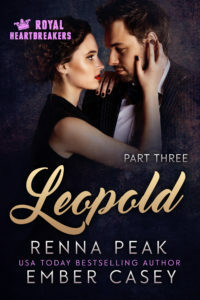 This is Part Three of a six-part contemporary romance serial by bestselling authors Renna Peak and Ember Casey and ends with a cliffhanger.